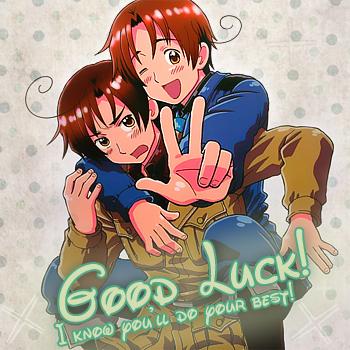 favorite character!What do you like about them?Are there any stories you want to tell us about them that you made up?Which do you like best,Italy or Romano?And you can do even more things about them. aww, i love them both! i ship DerIta and Spamano a lot - they are two of my OTPs. i'm in the middle of a fanfic for Spamano; maybe i'll post it on the fanpage when i'm done. COOL,I love them both also,but I cant get me eyes of the screen whenever they show up together...they are so funny and cute together! i like them both as well. there cute brothers right next to Iceland and Norway X3 i just love them.